This is B5, not B20, so it costs 30 cents a gallon more. Buying fuel at an Albany gas station, a customer made a point of mentioning that at a Lebanon station, he could get diesel for 30 cents a gallon less. That’s right, he could. The reason is that the state does not collect its 30-cent tax on fuel that contains at least 20 percent of “biodiesel” made from used cooking oil. You’ve heard a lot in recent years about the fuel tax no longer meeting the state’s highway needs because of greater fuel efficiency. But a shortage of gas tax income has not kept the legislature from doing a favor for part of the biodiesel business by exempting it from the tax, at least for now. In 2013, lawmakers without much fanfare passed House Bill 2435, which cancels the state excise tax on retail sales of B20 to passenger cars and pickups — any vehicle weighing 26,000 pounds or less — from 2014 through 2019. 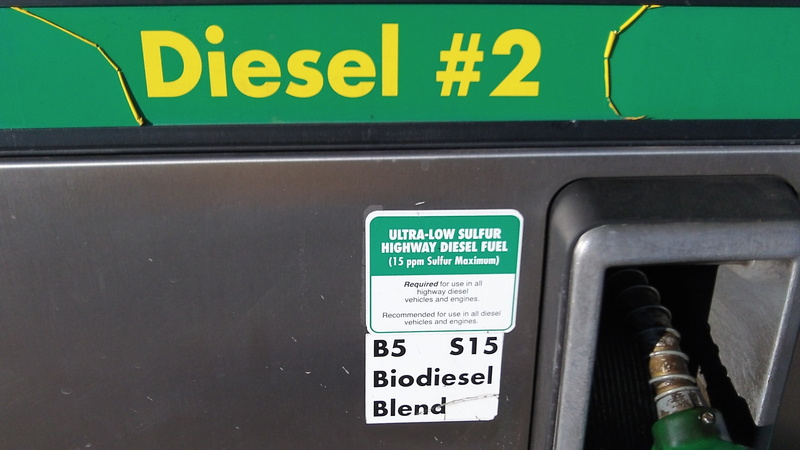 B20 is diesel mixed with 20 percent biodiesel derived from used cooking oil. The House passed the bill 37-23 when it first came up for a vote, with most Republicans including Andy Olson and Sherie Sprenger of Linn County voting no. The Senate rejected Republican amendments to the bill and then passed it 28-1. Then the House passed the Senate version 46-10, with Sprenger still among the opponents. There was not a lot of controversy about this bill to assist the processors of used cooking oil. Only an outfit called “Tax Fairness Oregon” raised questions. In written testimony, it said one company, SeQuential Pacific Biofuels, had already received nearly $5.8 million in tax credits and more than $8.7 million in state loans for a total state investment of more than $14.5 million. With that kind of state commitment to the idea of running cars on used cooking oil, it was a small step to add another gift in the form of a tax exemption. For a while, ODOT required service stations to record the plate numbers of all vehicles buying the tax-exempt B20 to make sure it was pumped into qualified vehicles only. But David Nemchik of the ODOT Fuels Group says the requirement proved burdensome on stations and has been scaled back. Now sellers of B20 are supposed to record sales on only one day a month — he thought it was the 10th — so ODOT gets a representative sample. I have a friend in Bend that uses a diesel service for his truck. The owner says that bio-diesel has been great for his business. It fouls up the injectors more frequently. Not to mention it gums up the fuel pump. Like ethanol, bio-diesel is a solution that cause’s more problems in engines than it fixes. Just another example of crony capitalism and “do-gooderism” by our Progressive Democrat legislature. This will of course, help alleviate the global warming/climate change emergency that we are facing. Aren’t we all glad we’re paying for this pigs-at-the-trough rip-off?